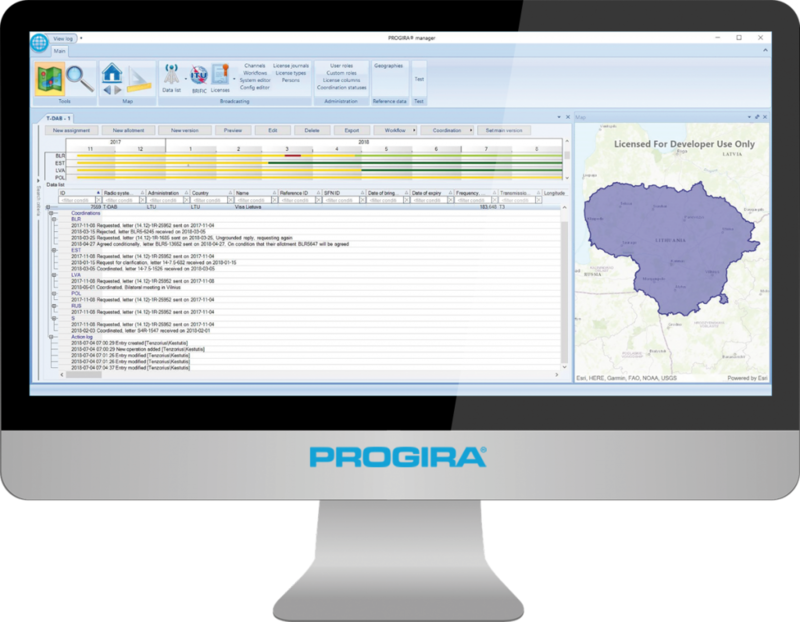 Spectrum management just got easier, as PROGIRA unveils the latest addition to their portfolio of innovative solutions for spectrum and network planning – PROGIRA manager. “It is an integrated spectrum management system designed by spectrum managers, for spectrum managers,” said Chief Program Developer, Kestutis Lumbis. He happens to have more than ten years of experience in spectrum management under his belt. PROGIRA manager streamlines the management of spectrum, by integrating and automating all operations associated with the process of spectrum management; such as license application, complaints handling, spectrum planning, frequency allocation, reporting, and monitoring. Each action or process within spectrum management generates staggering amounts of data. In today’s world, single data items are insufficient. Moreover, data silos can seriously impede an organization’s collaboration and productivity. On the contrary, PROGIRA manager prevents silos by bringing data together onto a user-friendly platform. Its interface is designed to enable easy visualizations of data and their interactions with each other, enhanced by various graphical forms, such as maps and timelines. That means users can have a more precise and unified picture of their data. PROGIRA manager integrates multiple spectrum management processes and functions into one single, secure, scalable, and stable solution. The ultimate goal: create a system in which users can achieve more with by doing less. One size does not fit all in spectrum management systems. Hence, another key focus in the design of PROGIRA manager is to create a firm basis for customizations. PROGIRA manager avoids reinventing of the wheel so that installations can begin promptly. Central to PROGIRA manager is technology. Riding on the successes of PROGIRA plan, PROGIRA manager users will enjoy the spectrum engineering tools already present in PROGIRA plan, plus much more, to facilitate frequency planning, allocation, and assignment. The system communicates seamlessly with compliance data. So users can coordinate, plan, and optimize the use of spectrum with maximum efficiency while complying with international regulations and bilateral agreements. Spectrum management may be complicated, but the feature-packed PROGIRA manager wants to make the process easy. Learn more about how this is possible through demos at IBC 2018, with features such as the Integrated data and license lists, Search manager, Workflows Editor, Smart data import, an internal auditing system.